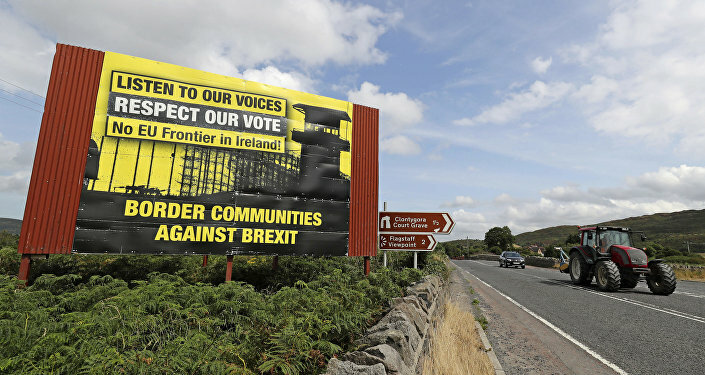 A senior member of the Northern Irish DUP party, propping up Theresa May's government, has said today that it looked like Britain would leave the European Union without a divorce deal. With more on this story, Sputnik spoke to the political commentator Pete Durnell, about what this means for the Brexit negotiations. Sputnik: So today, Jeffrey Donaldson, a senior DUP lawmaker has ruled that a no deal is the most likely outcome for Britain ahead of these talks. Are they right do you think, is Britain on course for a no deal? Pete Durnell: I really don’t think so personally. Essentially I think the Prime Minister will bully her cabinet into agreeing with a version of her Chequers plan and then the question is will they get it through the commons? It will be pretty tricky but I know they are already working with some rebel Labour MPs to help them so I suspect there will be quite a few tory rebels but I think they will squeak it through with Labour help. Sputnik: In his own words Donaldson stated that: "Such an outcome will have serious consequences for [the] economy of [the] Irish Republic. Can't understand why Irish Government seems so intent on this course." Could this influence Ireland and moreover the EU, in giving a comprehensive Brexit deal to the UK? Pete Durnell: The rumor seems to be that Ireland is potentially going to be given the ability to have to agree to ending all sorts of transition periods and backstops into 2021 and longer… It seems Theresa is going to give Ireland the power to effectively carry that on indefinitely because if they don’t agree to it we can’t accept it. I just feel that this has been going on since June 2016 and if we haven’t properly prepared and Ireland hasn’t properly prepared for even next year, but certainly in two years, if they can’t actually prepare for a No Deal scenario that’s pretty pathetic really. We’ve won World Wars in less time than effectively it’s going to take to leave the EU in 2021. I just think the main problem is that the people constructing this deal and pushing it through don’t really want to do it. If you give people a job who don’t want to do a job, you will get delays, over complicating and essentially you will end up in the situation we are in now. Pete Durnell: It’s a really difficult one to call. As I understand it, the Tory MPs come up with two candidates, they vote and throw their hats in the ring, as they say, and they choose two candidates and that goes out to the Tory membership to vote on. I believe the Tory membership is probably 70%-80% pro-brexit still; so they’re going to want a Brexit candidate but may not be given one. It could easier end up with two people who are basically Remainers which will be farcical situation. I honestly don’t know which two they might be… Justine Greening is mentioned, Sajid Javid is up there in the running, we know that David Davis is a candidate but will the MPs actually vote to put him in the top two. Views and opinions expressed in this article are those of Pete Durnell and do not necessarily reflect those of Sputnik.